Ever wish you could talk with your dream employer face-to-face? That’s exactly what many Berklee students had the chance to do at the 2018 Internship Expo. The Career Center brought over 30 employers from across the arts and entertainment industries to give Berklee students a chance to pitch themselves, discussing their ideas and dreams, and how they could fit into a company’s mission and vision. Companies on that participated covered a wide range of the industry, including Ableton, Apple, Do617, Live Nation, Indie Ninja, Sofar Sounds, and many others. Being a Career Center Ambassador, I got to experience the Expo differently than most students, as I had the opportunity to see the event behind the scenes. I primarily helped with the Virtual Meet-Ups at the Expo. 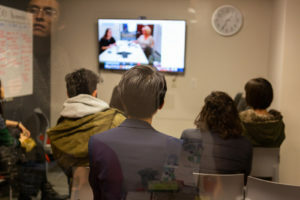 During the Virtual Meet-Ups, groups of students were able to interact with companies who couldn’t be here in person to learn about what internships these companies had for the spring and summer, including Cirque du Soleil, Position Music, and Paramount/Viacom. I wasn’t able to sit in on all of the Meet-Ups, but the one I attended was Paramount Pictures. Paramount being a large organization of many companies, there was a wide variety of internship opportunities ranging from business to music to film. Having multiple parts to a company definitely leads to many opportunities within the company to both start and grow a career, which I found extremely exciting. The most attention-grabbing internship for me was their music supervisor internship opportunity. As a music supervisor at Paramount, you help to place music in their ads and films. Being a lover of music, this sounds like a dream. I was also able to walk around the physical Expo and meet with some of the company representatives that were on campus. All of the representatives were so friendly and eager to hear about what students had to say and see where we fit. 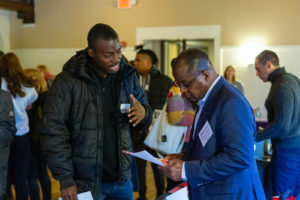 One company, North End Music and Performing Arts Center (NEMPAC) had more than one internship opportunity to discuss and gave information on all of them, which was the case at many of the tables. After hearing about the internships, I handed the representative my contact information and resume, and moved on to the next table. It was so exciting to physically hand my resume to an actual human instead of submitting it online! If you missed the Internship Expo this year, don’t worry—there is an Internship Expo every fall semester, and it gets better every year. There are also many other Career Center and career-related events hosted on campus to connect students to potential employers, including Career Jam, the Industry Trips, and frequent visits by companies looking for Berklee students to intern and work. Request an appointment or RSVP to the Internship Seminars on the Berklee Career Manager. Sam Smith has been studying bass for 11 years. 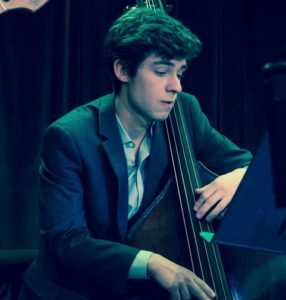 He is a dual major in Performance and Music Business/Management and is in his sixth semester. Smith plays in various professional and student groups around the Central New York and Greater Boston areas, and His musical accomplishments include: performer at the Syracuse M&T Jazz Festival and Carrie Lazarus’ Extraordinary Live (2013, 2014, and 2015), and recipient of the Skaneateles Music Guild Scholarship, George Reed Jazz Scholarship, and the North American Tour Scholarship.